This game started life as a Ludum Dare entry. There aren't very many levels yet. Many thanks to Antoine Bardoz for creating the awesome music and sound effects. 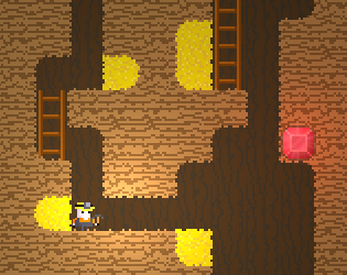 The aim is to mine all of the gold on each level. You control the game entirely with the mouse. You can restart a level with the button in the top-left of the screen (or 'R' on the keyboard). You can undo individual moves using the button in the top-right of the screen (or 'U' on the keyboard). For now you are free to skip levels if you get stuck. This is a work in progress, all feedback is welcome.